The Grand Prix awards one Full Sponsored Invitation for the Tokyo World Grand Prix to the winner (which includes flight and accomodation). If there are 151 participants, a second Full Sponsored Invitation for the Tokyo World Grand Prix will be awarded to the player ranked #2. If there are 301 participants, a third Full Sponsored Invitation for the Tokyo World Grand Prix will be awarded to the player ranked #3. Regardless the number of participants, the Grand Prix awards an Invitation for the Tokyo World Grand Prix to each of the TOP 4 players. 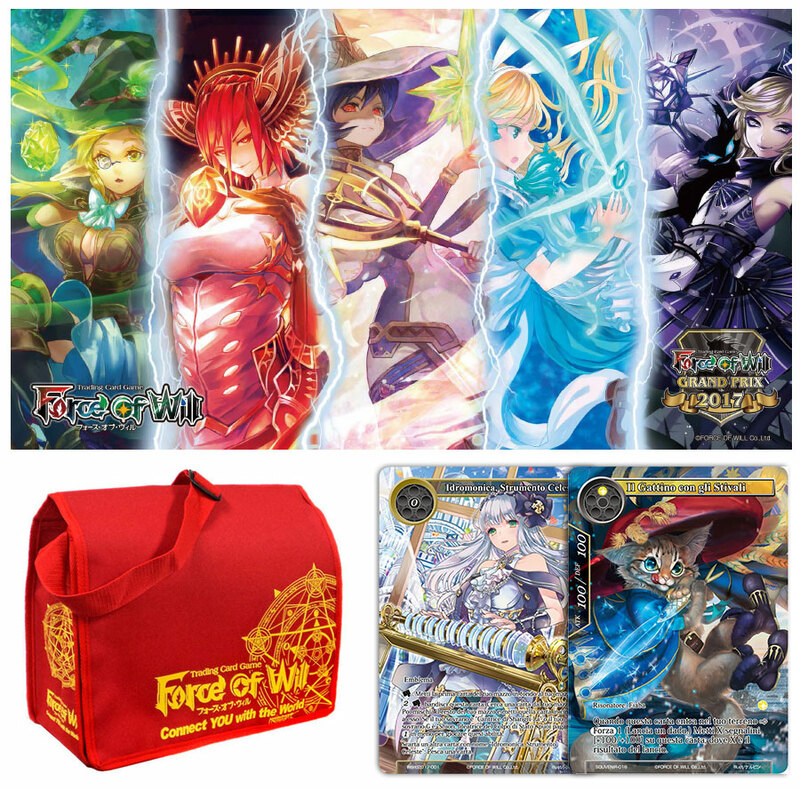 The Grand Prix is an open event and all Force of Will players may participate: it doesn’t require any invitation. Saturday 18th February 8:00 a.m.-10:30 a.m.; Player Briefing and Tournament Start: 10:30 a.m.
- Standard Registration: 25,00 euro (It features a Participation Promo Foil Extended Art Heavenly Instrument, Hydromonica and an exclusive Special Playmat WGP 2017). 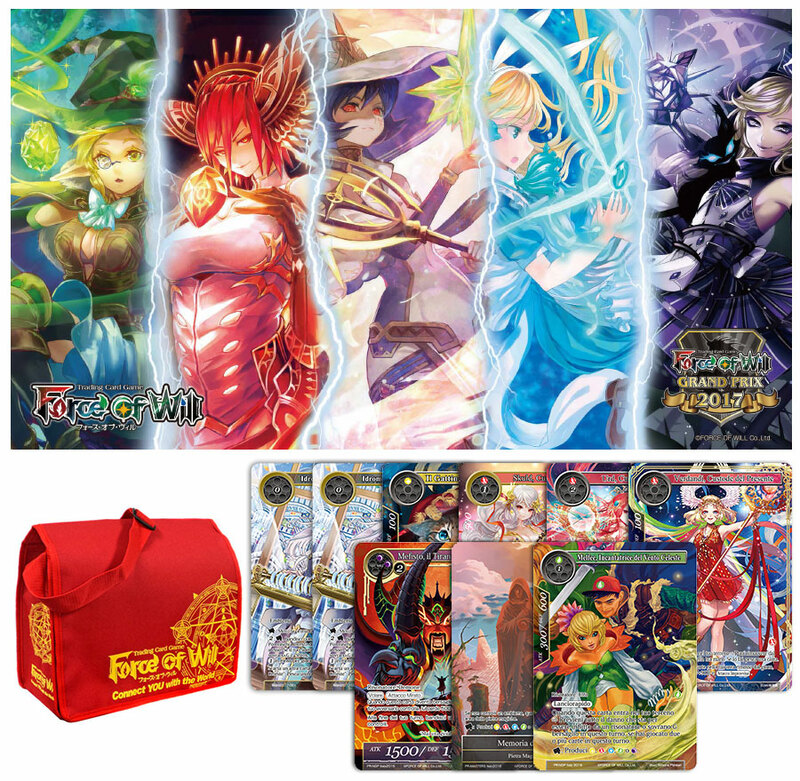 - Premium Silver Registration: 50,00 euro (It features a Participation Promo Foil Extended Art Heavenly Instrument, Hydromonica and an exclusive Special Playmat WGP 2017, a Participation Promo Foil Extended/Alternate Art Kid Puss in Boots, a special Force of Will bag, a FoW life-tracking pad and a FoW pen). - Premium Gold Registration: 75,00 euro (It features a Participation Promo Foil Extended Art Heavenly Instrument, Hydromonica and an exclusive Special Playmat WGP 2017, a Participation Promo Foil Extended/Alternate Art Kid Puss in Boots, a Participation Promo Foil Extended Art Keeper of the Future, Skuld, a Participation Promo Foil Extended Art Keeper of the Past, Urthr, a Participation Promo Foil Extended Art Keeper of the Present, Verdandi, a special Force of Will bag, a FoW life-tracking pad and a FoW pen). - Premium Platinum Registration: 100,00 euro (It features two copies of a Participation Promo Foil Extended Art Heavenly Instrument, Hydromonica and an exclusive Special Playmat WGP 2017, a Participation Promo Foil Extended/Alternate Art Kid Puss in Boots, a Participation Promo Foil Extended Art Keeper of the Future, Skuld, a Participation Promo Foil Extended Art Keeper of the Past, Urthr, a Participation Promo Foil Extended Art Keeper of the Present, Verdandi, a Participation Promo Foil Extended/Alternate Art Mephistopheles, the Abyssal Tyrant, a Participation Promo Foil Extended/Alternate Art Ruler's Memoria, a Participation Promo Foil Extended/Alternate Art Sorceress of Heavenly Wind, Melfee, a special Force of Will bag, a FoW life-tracking pad and a FoW pen). 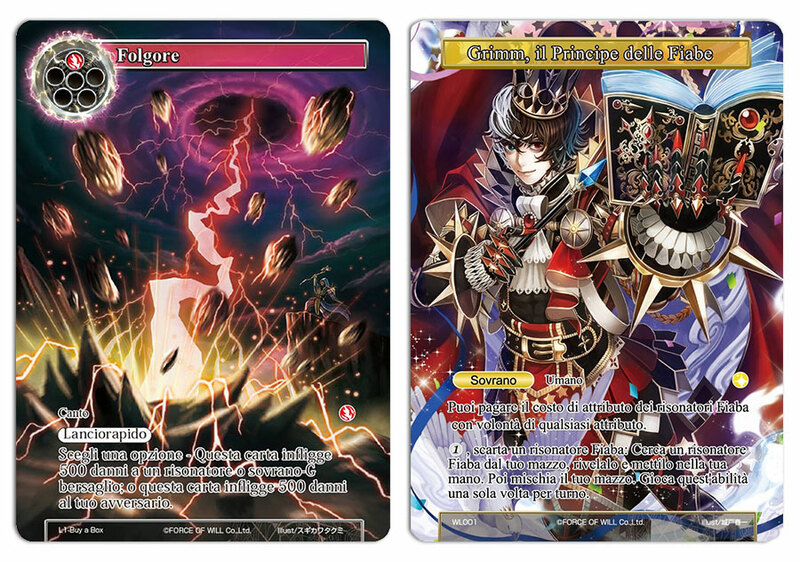 Players that spent at least a night in one of the two Hotels through the Force of Will offers at the bottom of this page will get a Promo Foil Extended/Alternate Art Lightning Strike and a Promo Foil Extended/Alternate Art Grimm, the Fairy Tale Prince. Main Deck must include a minimum of 40 cards. Magic Stone Deck must include from 10 to 20 cards. Each player may have a Side Deck of maximum 15 cards (it may include Ruler and/or Magic Stone cards). Day 1 (Saturday 18th February): There are 7 Swiss Rounds during Day 1. After these Swiss Rounds, only the top 128 players in general standings will advance to Day 2. Day 2 (Domenica 19 Febbraio): Player Briefing and Tournament Start: 9:30 a.m. Only the top 128 players in Day 1 general standings advance to Day 2. There are 3 more Swiss Rounds during Day 2. After these 3 Swiss Rounds, the top 16 players will advance to a Single Elimination Playoff to dermine the final winner. You need a valid FoW ID in order to create your decklist with the Deckbuilder and send it online to the Organization. If you are from another European country, you need to register a guest account and login here. If you already registered a guest account, you can use that. Each Swiss Round lenght is 60 minutes to play a best of three match (the player winning two games is the match winner). 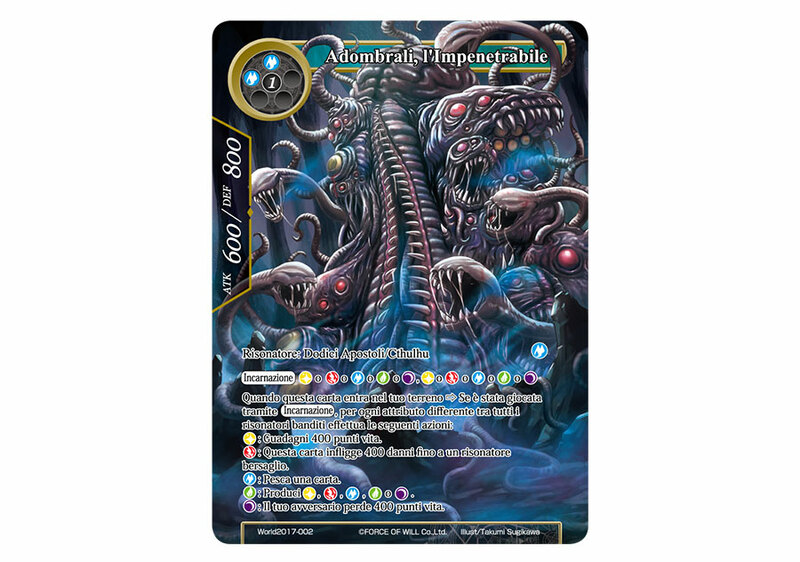 TOP 64: TOP 64 players receive a Promo Foil Extended Art/Alternate Art Adombrali, the Unfathomable. An overall prize amount equal to 2 booster pack multiplied by the number of participants will be divided among the top 64 players. 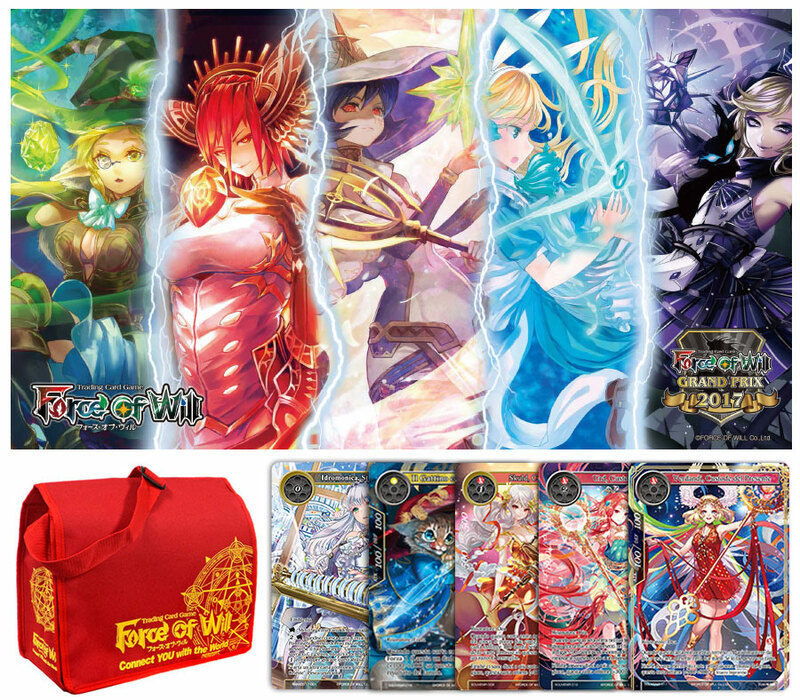 TOP 8: TOP8 players will receive each one a Special Super-Esclusive metal or acrylic Card Charlotte, Determined Girl. Winner gets a Full Sponsored Invitation to World Grand Prix 2017. Regardless the number of participants, the Area Grand Prix awards an Invitation for the Tokyo World Grand Prix to each of the TOP 4 players. In order to use the above offers, we recommend you to contact the Hotel by phone +39 0422 703811 or by email at booking@cpvenezia.it.